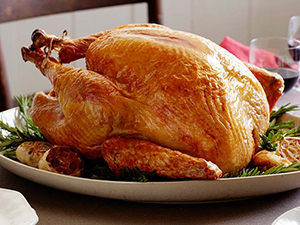 Thanksgiving is almost here so, of course, this blog entry is all about food! This year Kyle and I are having a HUGE Thanksgiving dinner with family and friends from all over coming in town. I wanted to get creative with my menu so after scouring the Internet and Pinterest for days, here is what I have come up with in case you need some inspiration! I have included links to all the recipes I found as well. I hope you enjoy them and may God bless you and all of your families this holiday season! Since we are hosting a very large group (some friends, some family) and some have not met before, I thought somethinginteractive would be fun. Therefore, I am doing a wine and cheese pairing. 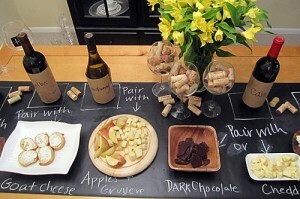 Take some chalkboard paper (which you can get at your local hobby store), lay it out and then write the different cheeses you’re displaying along with what wine pairs with them in chalk. It is something fun and different for guests to try and talk about with one another. I am also going to have on-hand crispy Italian bread drizzled with olive oil, raw almonds, apricots and red grapes to complement the various cheeses. Here is a handy guide to help you pair your cheeses and wines. 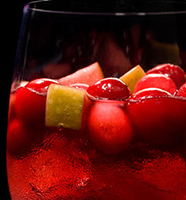 Speaking of liquor, everyone loves a fun holiday-themed drink! So this year, I am doing two: a warm crock pot drink literally called “Thanksgiving in a Glass” and a festive spiced cranberry sangria. I can’t wait to give these atry! Next, instead of doing a normal soup or salad to start, I wanted to do something that everyone could enjoy since there are various ages present. I am going to do a fun salad bar with fall toppings, like sliced pears, cranberries, butternut squash, pumpkin seeds, pomegranate seeds and spicy pecans. 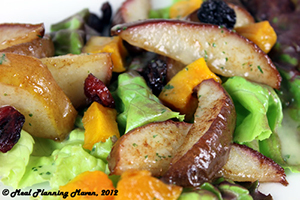 Of course, there will be a variety of dressings but the one I am most excited to make is a Honey Apple Vinaigrette! This will be the perfect topper over a yummy fall salad! The main meal is up next! We are Italian so we always cook to feed a small army…wait, who am I kidding? A large army actually and that would be an understatement! This year we are doing two different types of turkey: a deep fried one and a regular one. I must confess that I am not cooking the deep fried turkey. I have watched too many news reports on how horribly wrong the process can go (so be careful if you’re going to give it a try) but I am preparing the regular turkey. Again, because I am Italian, we usually add a dash of this or that as we see fit, but here is a general recipe to follow. We always serve two types of potatoes: a sweet potato and a regular mashed potato. I don’t mess with tradition so here is the recipe for the sweet potatoes we always make and I can’t lie, they are AMAZING! Mashed potatoes need to be creamy and a mixture of sour cream and cream cheese really do the trick! Plus, this recipe is prepared using a crock pot so you don’t have too watch them too closely. I suggest adding a little bit of parsley to this recipe. For dressings, I always like to make one with meat and one without. These are two new recipes that I have never tried before but am very excited about! I have never tried corn pudding before, let alone Tennessee Honey Corn Pudding, but if I have a bunch of Italians driving down from Chicago, I felt like I had to give them something Southern! I also plan on doing a pasta dish but I can’t share my Nonnie’s sauce, sorry! All I will say is, add a pork bone to your sauce and serve it the second day…it’s always better! Finally we get to dessert! 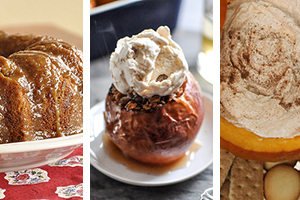 Of course, we will have pumpkin pie but I found a few new recipes including a caramel appleBundt cake and bourbon baked apples. As you know, I always like to have a healthier option on hand so I’m going to give this low fat pumpkin dip a try! It is served with sliced apples and vanilla wafers.